Omerta is the Code of silence when dealing with the government. It literally means "manhood" and refers to the idea of a man dealing with his own problems without the help of an law-body, but the term has a also become synonymous with Mafia's code of silence. 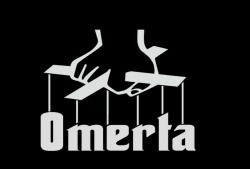 Omerta is a very popular attitude in places of Southern Italy like Sicily, where the Mafia is strong. It all began in Sicily around the 16th Century A.D. as a way of opposing Spanish rule. Sicily is the largest island in the Mediterranean and as such influence many countries to invade and conquer it and then make immense riches from it. The local people were often enslaved by the conquering party and were often treated very inhumanely by the foreign overlords. The Mafia was born is such circumstances and provided the oppressed Sicilian people with protection, stability and a kind of "pride". The Mafia's "Vendetta" became Sicily's justice system and no one approached the ruling body for any help. The continuous invasions left the Sicilians with feeling of helplessness, mistrust and rage at the government. They believed that the government was there not to help them out, but to make things even more difficult. As a result, the Mafia's golden rule of Omerta was born. It became an unwritten law to keep the government out of their private affairs. Crimes began to be considered personal and justice was received through personal vengeance and vendetta, not by the decision of the government. "Whoever appeals to the law against his fellow man is either a fool or a coward. Whoever cannot take care of himself without police protection is both. It is cowardly to betray an offender to justice, even though his offenses be against yourself, as it is not to avenge an injury by violence. It is dastardly and contemptible in a wounded man to betray the name of his assailant, because if he recovers, he must naturally expect to take vengeance himself. A wounded man shall say to his assailant: If I live, I will kill you - If I die you are forgiven." The accusation of being an informant was the worst possible stain on the manhood. Each individual was obliged to prove his manliness by not appealing to legally constituted authority for redress of personal grievances. A victimized person is expected to avenge the wrong-doing himself or find some patron who will do it for him. It is shameful to even betray one's deadliest and worst enemies to the authorities. Breaking the code of Omerta in serious cases specially if Mafia is concerned can lead to the assassination of the informant by the Mafia.